Outfit your swimming area with the right product when you shop with Aqua-Stairs ®. Our inventory includes boat dock ladders and other options for piers, seawalls, bulkheads, and boats of all sizes. Turn to us to discover more on our 4-step dock ladder and 5-step dock ladder as well as longer ladder selections. These boat dock ladders are perfect for floating docks or fixed position docks, including piers, seawalls, and swim platforms. The Aqua-Stairs easily mounts to any surface with a 90° angle. We also have created the solution for pontoon boat ladders for rear and side mounting. Aqua-Stairs marine ladders are very enabling swim ladders given their staircase design. People and dogs sit or stand on them in the water without having to hold on since these are significantly angled ladders, just like stair steps. People of all ages can easily get in or out of the water with these boat dock ladders! In fact, these steps have enabled our older citizens to get in and out of the water where they were previously unable with conventional vertical dock ladders. Some people with certain disabilities or handicaps also use the Aqua-Stairs dock ladders as well. Customers use the water more now than ever before because it is so easy to get out on these stairs. Further, customers cite that their parents enjoy the water again since they can get out. One ladder for both people and pets: as a dog ladder, dogs can easily get back out of the water without you having to either pick them up or send them back to the shore, tracking mud back onto your dock making it dirty and slippery. And in case you aren’t watching your pet, it can just come up the dog boat ladder on its own. No need for a dog ramp; it is the perfect dock dog ladder. Our dog loves it! The boat ladder models fit a large variety of boats, especially pontoon boats. Originally designed as a sloped dock ladder to walk out on, not a swimming pool ladder or traditional dock ladder which you climb straight up and down. The best dock accessory that you will ever buy! 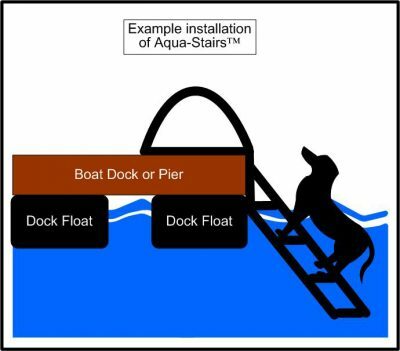 See how easy our dog dock ladder and dog boat ladder make it to get out of the water. Boat dock ladders and dock dog ladders come in many options, including our 4-step ladder and 5-step boat ladder. Contact us to explore our selection of ladders. We offer a variety of products for customers nationwide.